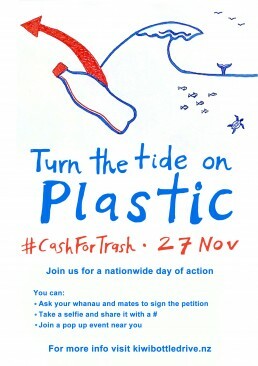 Wherever you are, join us on 27 November for a day of action calling for a cash for trash, bottle deposit system in Aotearoa. With this circular economy system we’ll protect our ocean from toxic plastic pollution, and help our communities realise a world without waste. The nationwide day-of-action is part of the lead up to the delivery of our petition to Parliament on December 4th. We need the people at the beehive to hear our message loud and clear, and you can help make this happen by reaching out to people in your life and community. Will you take part? Face to face conversations asking for petition signatures will make a difference, so can you talk to people you know and ask them to sign up the petition? The conversation is surprisingly easy and we’ve made this advocacy guide to make it even easier. If you want to go more in depth, we’re hosting a webinar at 6-7pm Thursday 8th November. 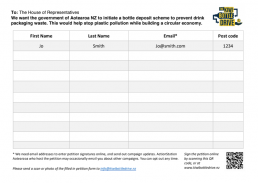 You can RSVP to rowan@kiwibottledrive.nz or just follow this link to the call. Another way of taking action is to take a photo and post it on social media using our hashtag #TurnTheTideOnPlastic and with a sentence about why you want Aotearoa to get a #CashForTrash bottle deposit scheme. You could write the hashtag on a piece of paper on a piece of paper and take a photo with friends who just signed the petition, celebrating everyone’s involvement! There’ll also be fun lunchtime pop-up events happening in cities and communities around the country. These visual examples will show how cash for trash can protect our seas from plastic pollution. They’re being co-organised by our friends and colleagues throughout the zero waste movement to reach people who haven’t heard of the campaign yet. If you’d like to help run one, get in touch with rowan@kiwibottledrive.nz. To head along on the day, keep tuned to our Facebook page for more details.